Turkish cuisine is one of the most appetizing and rich cuisines of the world, and Turkish people are known to be quite passionate about food. Diversity and the full flavor makes the Turkish cuisine worldwide famous which draws influences from its rich history and each region in the country today praises its own specialities. 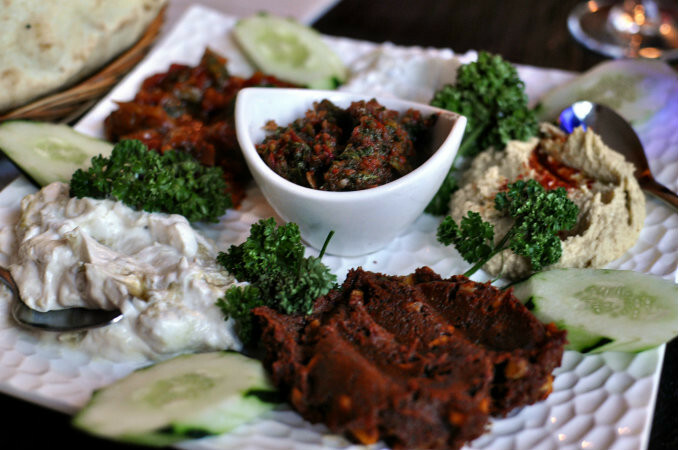 The richness of Turkish cuisine is based on several factors: Variety of products cultivated on the lands of Asia and Anatolia, numerous cultural interactions in history, the palace kitchens of Seljuk and Ottoman empires and geographical conditions that shaped the character of Turkish culinary culture. The Turkish art of cooking has a long and deep-rooted past and its cuisine varies across the country. The culinary culture of Istanbul, Bursa, Izmir region inherits many elements of vast Ottoman cuisine. The Marmara, Aegean and Mediterranean cuisines are rich in vegetables, fresh herbs and fish. Olive oil is most widely used. Black Sea region’s cuisine uses fish extensively, especially the Black Sea anchovy (hamsi). It’s influenced by Balkan and Slavic cuisine and includes maize dishes. The cuisine of the southeast—Urfa, Gaziantep and Adana—is famous for its kebabs and dough-based desserts such as baklava, kadayıf and künefe. Central Anatolia has it’s own specialties, such as keşkek, mantı and gözleme. İstanbul, however, is the city where almost all kind of cuisines can be tasted, due to its multicultural structure of a metropolis. Particularly Beyoğlu, Sultanahmet and Kadıköy are the districts for heavenly food. Aside from Western food presented amply as an alternative, there are numerous eateries specialized in their fields for a very long time such as comfort food restaurants, esnaf lokantası, i.e. tradesman’s restaurants, and sea-food restaurants. Key ingredients being primarily meat, vegetable and legumes, Turkish meals are generally soupy, consisting of some kind of stew or stock. Hence, bread consumption tends to be way too much among Turks. Turkish kebabs, döner kebab, Turkish ravioli and some eggplant dishes are the trademarks of Turkish cookery. There are over 200 dishes made from eggplant. Breakfast is crucial part of meal for Turks. Although it varies regionally, Turkish breakfast is the healthiest, rich in nutrients and the most delicious. A lot of green, tomatoes (preferrably in summer), cucumber and pepper are eaten during breakfast along with feta cheese, egg, olives, honey and cream of milk. Multi-grain village bread, corn bread and simit, Turkish sesame donut or Turkish bagel are the preferred breakfast components. Especially Sunday breakfasts turn into a convivial social gatherings with added ingredients and last longer than week-in breakfast. Turkish kebabs are the main meat dish with a great variety of cooking methods. Under the names of Döner Kebab, Adana Kebab, Bursa Kebab, Ali Nazik and İskender. Kebabs have various cooking methods depending on the ingredients and the way of cooking, generally served with rice, bulgur rice and greens. The origin of döner kebab goes back to Central Asia where it was known as Lüle Kebab. Its name was also mentioned in Anatolian travel memoirs of the 18th century. Another meat specialty is köfte, meatballs, its name derived from a Persian word, kufte. It was adopted into Turkish cuisine in the 13th century. There are many versions of meatballs, the technique of cooking differ by the region. A large variety of meatballs, more than 200 kinds, are known in Turkey. Lahmacun, a thin flat bread covered with a layer of spiced minced meat, is another popular takeaway food, generally accompanied with ayran, a buttermilk drink. Bean soup and rice, reputably, are the indispensable meal duo among other Turkish foods. Mostly served in soup form on top of rice, rich in carbs and protein, this is the popular menu in most restaurants for Turkish people. The cuisines of Aegean and Mediterranean are mostly olive oil based cold dishes as main course or starters. Especially dolma (stuffed bell peppers, zucchini etc. ), barbunya pilaki (red bean salad with olive oil), deniz börülcesi (seasonal samphire salad) are the ‘must taste’ specialties. Makarna (macaroni) is almost similar to pasta of Italian cuisine. Turkish homemade pasta is called erişte, prepared with walnuts, Feta cheese or various sauces. Turkish pastries are mostly milk-based or dough-based desserts. Sweet pastries, mainly baklava, are soaked in syrup. Baklava, sütlü nuriye, ekmek kadayıfı are among the most popular desserts. Fırında Sütlaç, keşkül and profiterole are the most favorite Turkish milk-based desserts. Künefe, made from shredded wheat with a layer of melted mozzarella-like cheese and syrup, can be easily found in Istanbul even though it is a Southern specialty pastry. Tea is a sine qua non drink for any Turk. Tea is served during breakfast and offered almost all day long. Especially, if you are invited to a store or an office, tea is ordered right away. Turkish Coffee after meals is also part of a Turk’s daily habits. Ayran is the most common cold beverage made from yoghurt mixed with water and salt. Sometimes a piece of fresh mint is added. It is an ideal drink during hot summer days, bottled, packed or home made from vendors. In Turkey, people love eating and relishing food. Most meals at a typical Turkish home is like a feast. If you are a guest for breakfast, lunch or dinner, the variety of food and sincere hospitality of the people might seem quite surprising at first. Inviting guests for a meal is part of culture and tradition of a Turkish family and ‘taking good care’ of the guest is the crucial side of it. Çorbalar: Soups, generally served before the main dish, especially in winter season. Mezeler: Mezes, Mostly cold served, olive oil based appetizers. Dolma & Sarma: Stuffed vegetables or rolled leaves with rice or meat stuffings. Salatalar: Salads of various kinds from different regions. Zeytinyağlılar: Olive oil vegetable dishes which are usually served cold. Pilavlar: Rice or bulgur pilaf variations. Etliler: Meat dishes mostly cooked with vegetables. Börekler: Stuffed or rolled pastries with meat, cheese or vegetable fillings. Pideler: Kind of flat bread with cheese, vegetables or meat. Kebaplar: Kebabs range from kebabs cooked in a pot to skewered kebabs. Balık ve Deniz Ürünleri: Fish and other seafood such as shrimps and squids. Tatlılar: Desserts that range from milk-based tastes to baklava like pastries.